The fear of the LORD [is] the beginning of wisdom: and the knowledge of the holy [is] understanding. The more I study true education, the more I realize how far away from it the world has fallen. And yet he did not attend the schools of his day, neither public, nor private. The education that Jesus received placed him in advance of those who attended the schools of the day. In modern day language, Jesus was a homeschooler. The 3 R's and what we traditionally deem as "school" are actually incorporated into this 3 part model. For example, Science begins by learning about the body God made for us. "God gave us two eyes to see with." 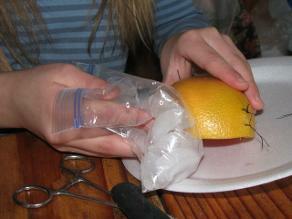 Physiology is one of the first things children should learn about-how to take care of our body temple. How our food is digested, what we should eat, what our liver does, etc. may all be taught as part of knowledge of God's will for us. Other studies in nature teach respect for an Almighty God, such as study space, what can be seen under a microscope, etc. But you may say science is easy, what about mathematics? This is one of the most difficult, but not impossible to incorporate into this model. For example, prophecy requires arithmetic, building a scale model of the sanctuary or Noah's ark also require some math. Math can also be incorporated into practical skills such as cooking, carpentry work, sewing, etc. Even more advanced skills, like statistics, may be incorporated by studying what percentage of the world has been reached by the gospel. Banking and accounting are also practical skills. At an early age children should learn the value of money and how to return their tithe to God. Recently, I came across a great way to incorporate geography and social studies into this model. One family began study different countries by reading mission stories about them. Our own family printed off a map to see how many countries Bible Picture Pathways has been able to touch with God's truth. History may be studied in the light of Bible prophecy and we have also found that many of the well-known events of history are wonderful object lessons. Visit our history lessons page for some ideas. The first part of this three part model of true education is Knowledge of God, which as we have already learned is the source of true wisdom. This knowledge must begin with and be founded on the word of God. Teaching your children right from wrong, how to study the Bible for themselves and reason cause to effect is an important part of this process. All other "wisdom" and "science" must be first tested by the infallible word of God. Teaching your child reading skills from the Bible and religious books is an excellent way to implement this part of the model. Memorizing scripture in word or musical form is also a wonderful way to increase the intellect. Profitable poetry would also fall into this category. The second part of our model is Practical Skills. This includes teaching your children responsibility by having them do chores. From the time they are very young they can help set the table, tear lettuce for salad, etc. Regular jobs like taking out the trash and doing dishes or cooking should be implemented as they get older. Unfortunately, many school children never learn to work because their parents do much of the work for them due to their heavy school schedule. Children also need to learn skills that may be necessary later in life, such as sewing, basic carpentry, basic auto mechanics and how to cook healthfully. In academy I had dorm mates who didn't know how to sew on a button or iron. In college, there were people who had no idea how to peel a potato, and I cannot imagine the embarrassment of a women who had to ask for help because her husband didn't know how to change a tire. 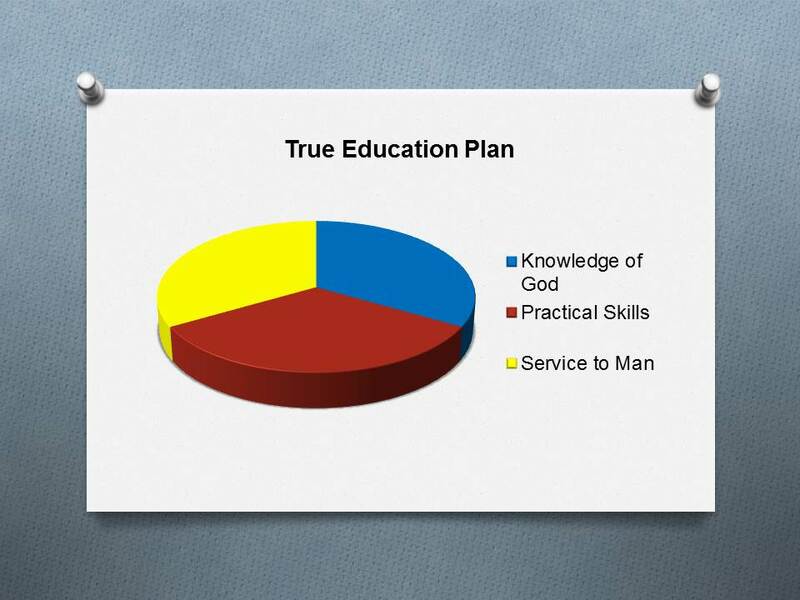 The third portion of our model of true education is Service to Man. This is the portion that is often forgotten. Just as we are to give God a portion of our money, a portion of our time should be devoted to helping others and ultimately to spreading the gospel to the world. If we would have well balanced adults, these skills must be developed in childhood. This may be as simple as making scripture bookmarks to give to people, singing hymns at a nursing home, reading to someone with failing eyesight, or volunteering at a homeless shelter. It can be as complex as compiling literature, opening a website, making a documentary showing God's plan, or preaching a youth evangelistic series. Use your imagination. Music, Writing and computer skills are easily worked into this portion of the model. Do something for God, reach someone for the kingdom. One more tip, for today-- tailor the schooling to the student. At some point I was introduced to the idea of "unschooling", teaching your child basic skills (reading, math,etc.) and then giving them the tools to work with to increase their knowledge in the field of their interest. My thought on this form of schooling is that children remember best what they enjoy. Simply feeding information in, to be forgotten after the test, is worthless. My son, Trenton who died in June 2013, was interested in 3-D modeling, so we had him make scale models of the sanctuary and Noah's Ark. My daughter is interested in history so she compiled a documentary on the origins of the holidays. Don't try to put every child in the same box. The Bible was written for multiple learning types. We can learn from that. Encourage your child to use the talents that they have for God, and help direct their efforts toward a profitable cause. Prov. 22:6 Train up a child in the way he should go: and when he is old, he will not depart from it.